In delving into the connectivity concept and approach, members of the California Roundtable on Water and Food Supply (CRWFS) felt that it was very important to look to existing and emerging projects that were already embracing the concepts being discussed. Projects were selected to highlight the three high priority areas for effecting change: connected thinking, institutional linkages, and public engagement. 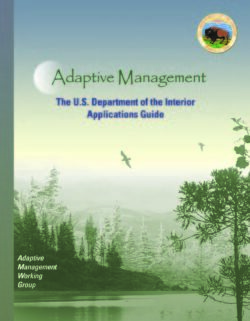 The five examples included in this booklet as case assessments illustrate several ways the connectivity approach is currently being applied throughout California. The assessments are intended to generate ideas for applying the guiding principles of the connectivity approach and the positive impacts that emerge from them. The assessments are not meant to serve as an evaluation of the merit of the projects. 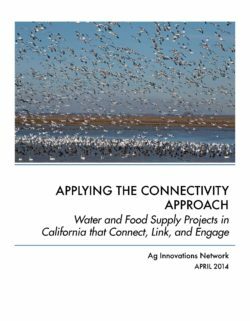 This booklet is intended to accompany From Crisis to Connectivity: Renewed Thinking About Managing California’s Water and Food Supply, which more fully describes the connectivity approach illustrated here. 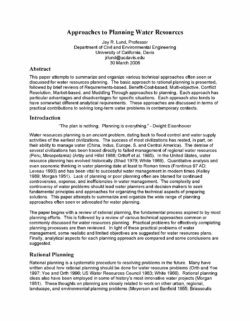 This paper attempts to summarize and organize various technical approaches often seen or discussed for water resources planning. The basic approach to rational planning is presented, followed by brief reviews of Requirements-based, Benefit-Cost-based, Multi-objective, Conflict Resolution, Market-based, and Muddling Through approaches to planning. Each approach has particular advantages and disadvantages for specific situations. Each approach also tends to have somewhat different analytical requirements. These approaches are discussed in terms of practical contributions to solving long-term water problems in contemporary contexts. 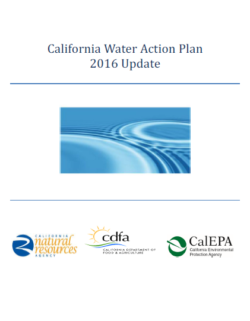 Climate change creates critical challenges for California water resources management. The vulnerability of the water sector to climate change stems from a modified hydrology that affects the frequency, magnitude, and duration of extreme events, which, in turn, affect water quantity, quality, and infrastructure. Warmer temperatures drive the snow line higher and reduce snowpack, resulting in less water storage. Intense rainfall events will continue to affect the state, possibly leading to more frequent and/or more extensive flooding. The acceleration of sea level rise will produce higher storm surges during coastal storms. statewide levels are already available. 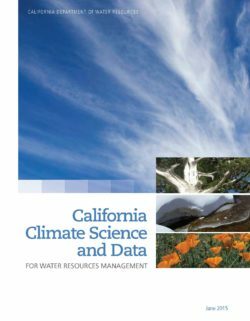 Water supply managers in California have multiple tools and institutional capabilities to limit vulnerability to changing conditions, which can also serve as response mechanisms to a wide range of climate changes. California has seen many flood events, including the most recent flood of 1995 when 48 of 58 counties declared a state of emergency. After two years of dry weather and shrinking reservoir supplies, we are reminded once again that nothing focuses Californians’ attention on our limited water resources like drought. There is broad agreement that the state’s water management system is currently unable to satisfactorily meet both ecological and human needs, too exposed to wet and dry climate cycles and natural disasters, and inadequate to handle the additional pressures of future population growth and climate change. Solutions are complex and expensive, and they require the cooperation and sustained commitment of all Californians working together. To be sustainable, solutions must strike a balance between the need to provide for public health and safety (e.g., safe drinking water, clean rivers and beaches, flood protection), protect the environment, and support a stable California economy. 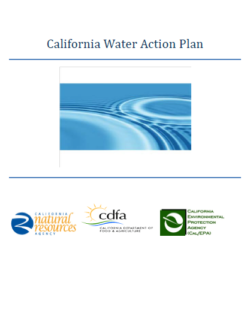 This action plan lays out our challenges, our goals and decisive actions needed now to put California’s water resources on a safer, more sustainable path. While this plan commits the state to moving forward, it also serves to recognize that state government cannot do this alone. Collaboration between federal, state, local and tribal governments, in coordination with our partners in a wide range of industry, government and nongovernmental organizations is not only important—it is essential. The input and contributions received from all of these partners throughout the drafting of this action plan have resulted in a comprehensive and inclusive plan. The Central Coast Hydrologic Region is the most groundwater-dependent hydrologic region in California, with approximately 80 percent of agricultural, municipal, and domestic water demands met by the extraction of groundwater. Imported surface water allocations from the State Water Project (SWP) and the Central Valley Project total up to 106,000 acre-feet (af) per year; however, actual volumes of imported water received vary annually. The economy of the Central Coast relies heavily on agriculture and viticulture, which thrives in the temperate climate, rich soils, and moderate rainfall. 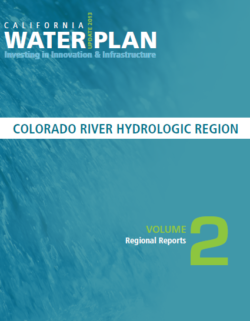 Major water-related challenges for the region include groundwater and surface water quality degradation, groundwater basin overdraft, flood risk, seawater intrusion, and aging infrastructure. 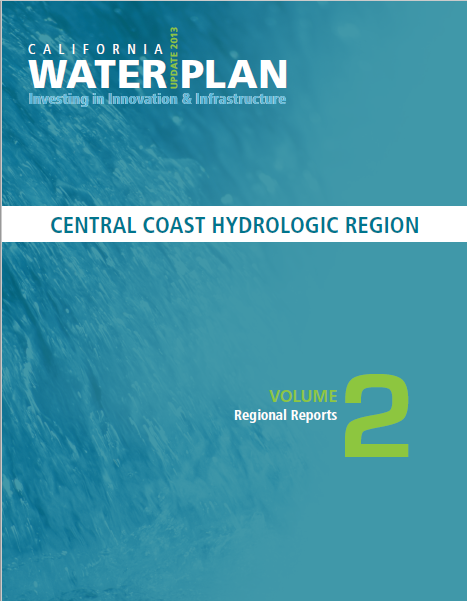 Urban, environmental, and disadvantaged community (DAC) interests in the Central Coast are currently well-represented in the region’s integrated regional water management efforts, which include new and updated integrated regional water management (IRWM) plans and numerous implementation projects. Water agencies in the region have not stopped planning and implementing programs and projects to maintain the quality and quantity of water supplies, particularly groundwater, for the future. 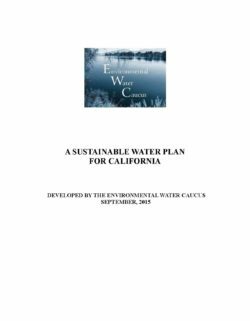 This includes water use efficiency conservation and groundwater storage and conjunctive use programs and water supply transfers. Activities are also under way to protect and enhance the region’s important environmental resources — in particular, the Salton Sea, which provides critical habitat for resident and migratory birds. 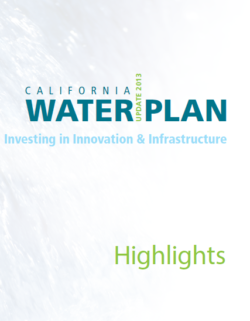 California Water Plan Update 2013 (Update 2013) is a resource and tool to guide investment priorities and legislative action and ensure resilient and sustainable water resources moving forward based on decades of scientific data and analyses, nearly 40 State agency plans, and the voices of hundreds of stakeholders. Update 2013 applies at statewide, regional, and local scales and serves to advise a diverse audience, including elected officials, planners and resource managers, tribal governments and communities, academia, and the general public. Consistent with State law, Update 2013 lays out recommendations rather than mandates.